Dr. Enrique Forero was born in Bogotá on December 7, 1942. He graduated as a Botanist at the National University of Colombia in 1965, and received the Ph.D. in the joint program of the City University of New York and the New York Botanical Garden in 1972. Professor of the National University of Colombia between 1965 and 1967, then between 1972 and 1986 and finally between 1995 and 2003. Research Director of the Missouri Botanical Garden, St. Louis, Missouri, United States of America between 1986 and 1991; international consultant of the National Center of Genetic Resources in Brasilia, Brazil in 1992 and Director of the Institute of Systematic Botany of the New York Botanical Garden from 1992 to 1995. Director of the Institute of Natural Sciences of the National University of Colombia in 1996 and Dean of the Faculty of Sciences of the same university between 1996 and 2000. 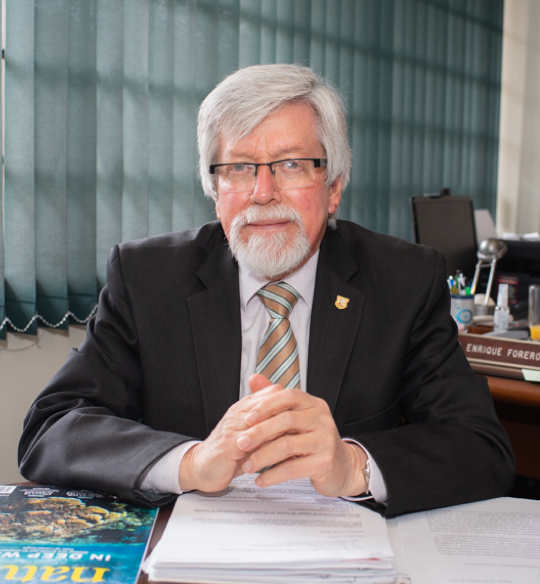 President of the Colombian Academy of Exact, Physical and Natural Sciences in the period 2013 – 2016, re-elected for the period 2016 – 2019; President of the Maximum School of the Academies of Colombia 2015 – 2017. Author of 120 scientific publications. Recognized as Researcher Emeritus by Colciencias in the 2017 announcement. Appointed a member of the Latin American Academy of Sciences in 2018. Appointed Honorary Professor by Universidad del Magdalena in 2018.